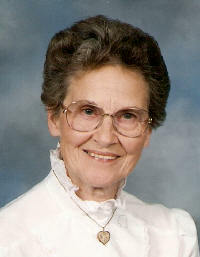 Mary M. Klasing, nee Sullins, 77, of Trenton, died Monday, July 30, 2007 at her residence. Mrs. Klasing was born December 12, 1929 in South Bend, IN to Sidney and Cecelia (Mueller) Sullins; they preceded her in death. She married Robert Klasing on June 11, 1949 at the First United Methodist Church in Trenton; he preceded her in death on June 10, 1994. Also preceded in death by a son, Curtis William Klasing, her twin sister, Marian Stubbs, brothers-in-law, Jim Stubbs and William Hazard, and a niece, Andrea Kreeger. Surviving are her daughters, Linda Rakers of Trenton and Diane (Jerry) Hanft of Freeburg. Also surviving is a granddaughter, Jennifer (Brian) Kuhl of Trenton, 3 Great-Grandchildren, Mytchel, Brady, and Carter Kuhl all of Trenton, and a niece Lynne (Steve) Irwin of Phoenix, AZ. In the past Mary worked as a teacher’s aid at Aviston Elementary and St. Rose Elementary, she served as an EMT for 14 years for the Sugar Creek Ambulance Service, and was the former co-owner of Bo Peep Boutique Baby Store in Trenton. She was a member of the First United Methodist Church in Trenton, United Methodist Women’s Association, and the Clinton County Historical Society. A memorial service will be held Saturday, August 4, 2007 at 11:00 AM at the First United Methodist Church in Trenton with Rev. Debbie Melzer officiating. Interment will follow in Trenton Cemetery. Visitation will be Saturday, August 4, 2007 from 10:00-11:00 AM at the First United Methodist Church in Trenton. In Lieu of Flowers, Memorials can be made to the First United Church Building Fund, the Sugar Creek Ambulance Service, or to the Clinton County Historical Society and will be received at the church or through Moss Funeral Home in Trenton who is handling the services.